Abstract : The AXES project participated in the interactive instance search task (INS), the known-item search task (KIS), and the multimedia event detection task (MED) for TRECVid 2012. As in our TRECVid 2011 system, we used nearly identical search systems and user interfaces for both INS and KIS. Our interactive INS and KIS systems focused this year on using classifiers trained at query time with positive examples collected from external search engines. Participants in our KIS experiments were media professionals from the BBC; our INS experiments were carried out by students and researchers at Dublin City University. We performed comparatively well in both experiments. Our best KIS run found 13 of the 25 topics, and our best INS runs outperformed all other submitted runs in terms of P@100. For MED, the system presented was based on a minimal number of low-level descriptors, which we chose to be as large as computationally feasible. 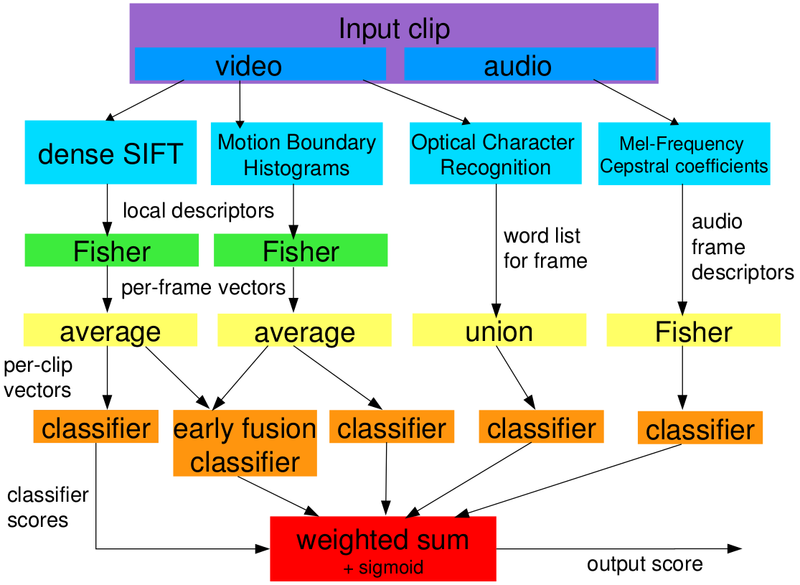 These descriptors are aggregated to produce high-dimensional video-level signatures, which are used to train a set of linear classifiers. Our MED system achieved the second-best score of all submitted runs in the main track, and best score in the ad-hoc track, suggesting that a simple system based on state-of-the-art low-level descriptors can give relatively high performance. This paper describes in detail our KIS, INS, and MED systems and the results and findings of our experiments.